It certainly is not the cultural equivalent of Harper Lee's upcoming second novel, "Go Set a Watchman" - yet the return of the '80s-90s T.V. show, "Full House" was announced last night by John Stamos on "Jimmy Kimmel Live!" A body language analysis of a few key moments gives us insight into what John Stamos was thinking - and whether or not Bob Saget is (yet?) on-board for the series return. Beginning at 1:01, Kimmel asks, "Will ah, your friend - your friend Bob Saget has to be on it, right?" 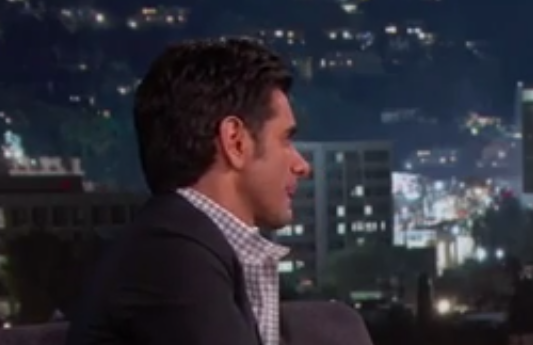 Stamos' first "Tongue Jut" (aka "Lizard Tongue") occurs during 1:06 just as Kimmel says, "... on it ... "
"Well - he bet-, he better be." His second tongue jut (with a lick lip) just after word "be". Kimmel: "He will be on it"
In this context, John Stamos' tongue jut/lizard tongue indicates his affirmative of, "Yeah" is deceptive. His earlier statement, "He bet-, he better be" tells us that Stamos feels a significant "stepping over the line" anxiety. Stamos feels he's put either the production company or Bob Saget (or both) in a difficult spot (one of them probably directed him to do so). The tongue jut is the psyche revealing to outside world, "I've been bad", "I've been caught", "I've done something foolish" or "I've gotten away with something" (Navarro)(when a tongue jut is clustered with other nonverbal signals it can indicate excitement or sincere self-deprecation). This example serves an excellent illustration of how the ability to interpret nonverbal behavior in real-time is profoundly valuable in the context of the sales process, a negotiation, deposition, testimony, etc. What other nonverbal signals did Stamos display which reinforce his deception.